Although the picture opposite makes her look like something from the film "Delicatessen", Lisa Angell is a singer who will be chanteusing to no avail through "N'oubliez pas". Like the UK, I tend to think if they didn't have a guaranteed place in the final, we'd probably never see them again. It's here It's ok, I don't mind it. Bravo la France. Mais oui. On Ho. "France is a fascinating and varied country, with the industrial and historic north contrasting with the beautiful and rural south. The high peaks of the Alps and the Pyrenees overlook the wine-growing plains of Burgundy, the orchards of Provence and the golden beaches of the Cote d'Azur. Everyone has their favourite part of France and you will never tire of exploring the country further." "No other city has had so much written about it, been the star of so many films. Charles V said that Paris was “not a city but a world”. Capital of France and the second largest city in Europe, Paris really is in a league of its own.One of the reasons that Paris is so unique is its symmetrical layout with large avenues running from north to south and east to west. Paris was not damaged during the two world wars and because of this, the city retains an incredible sense of architectural uniformity." A French judge has been caught masturbating in court. The un-named magistrate was seen masturbating in a court in Angouleme. Three witnesses, a lawyer, a woman in the public gallery and a journalist, all reported seeing the act. French newspaper Charente Libre, whose reporter was among the witnesses, said it happened as an attorney was pleading his case. The witnesses confirmed they saw the judge raise his judicial gown, open his trousers and "perform unmistakable movements". The head judge of the city's appeals court said a penal (not penile) inquiry was being carried out by the police while the magistrate was expected to undergo a psychiatric evaluation. Aah, la France, our close neighbours. A lovely country on the whole, with much to recommend it. 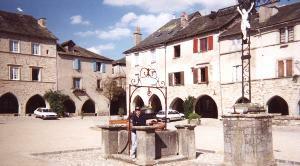 My personal favourites over a fair few trips have been the Camargue & Arles, Dordogne & Lot provinces, and Brittany. Unfortunately the French, especially in Paris, attempt to spoil it all. There's a town in France named Y.
c100BCE A community situated on an island in the Seine occupied by a tribe called Parisii. 52BCE Caesar finishes conquest of Gaul. 451 Attila's Huns plunders Metz. 1315 Parisian bakers found guilty of mixing flour with animal droppings during the Great Famine. 1431 Joan of Arc (19), burned at the stake in Rouen. 1638-1715 Dom Perignon, a French monk introduced blending, vineyard and cellaring practices. 1751 France set plans to tax clergymen. 1789 Citizens of Paris storm the Bastille, at the onset of the French Revolution. 1805 French fleet defeated at Trafalgar, Spain. 1815 Jun 18 British & Prussian troops defeat Napoleon Bonaparte at the Battle of Waterloo in Belgium. 1868 The first known bicycle race held. 1880 Rodin creates "The Thinker." 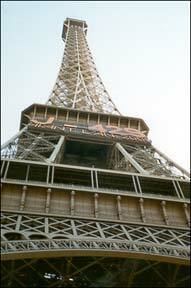 1889 The Eiffel Tower officially opened to the public. 1901 1st use of "getaway car" occurs. 1914-18 By the end of the war 1.3 million Frenchmen had been killed and more than twice that number wounded or crippled. 1939-45 Germany occupies much of France. Vichy regime established in unoccupied south. General de Gaulle establishes government-in-exile. 1944 Allied forces land at Normandy leading to liberation. De Gaulle sets up provisional government. 1992 France signs Maastricht Treaty on European union. 1995 France attracts international condemnation by conducting a series of nuclear tests in the Pacific. A Frenchman is facing deportation from Australia for allegedly hitchhiking and scrounging while pretending to be running around the world. Sylvain Quenel has been handed over to the Immigration Department after being detained at Eucla on the Western Australia-South Australia border. Police allege the man had been hitchhiking to towns, then seeking food and other goods while pretending to have made his journey entirely on foot. Residents along the route reported that the supposed runner had covered more than 40 miles in three hours. A French electricity worker is facing a disciplinary hearing after publishing a book that shows you how to survive in French corporate culture without doing any work. In Bonjour Paresse (Hello Laziness), Corinne Maier advises her readers to choose really 'useless' jobs as consultants, advisers, or experts. And she says the best way to avoid people asking what you have been doing all day is to arrive with a bundle of files under your arm. Ms Maier swipes at middle management, includes chapter heading such as 'Corporate Culture - Stupid People', and sums it all up by saying: "You don't have much to lose if you don't do much at work." Cezanne, Degas, Gauguin, Manet, Matisse, Monet, Pissaro, Renoir, Seurat, Toulouse-Lautrec, Michel Foucault, Rene Descartes, Jean-Paul Sartre, Marie Curie, Louis Pasteur, Rodin, Rene Lalique, Jeanne D'Arc, Louis Bleriot, and finally Auguste & Louis Lumiere.